It can be really hard to stop myself from eating pumpkin this time of year. I sometimes forget that apples, peaches and other delicious fruits are also in season. Today, I’m giving a nod to the apple tree that sits outside my window–the one and only apple tree that I haven’t killed with my black? thumb. I usually opt for making applesauce, apple crisp and apple waffles with the apples from my tree but I needed something sweet and went with apple toffee cookies. Life begins with these cookies folks. They are delicious! 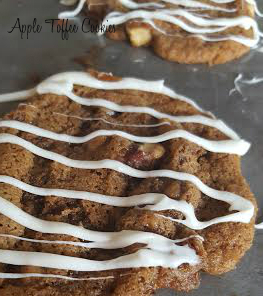 I’ve included some variations too for making these gluten free apple toffee cookies for those with gluten allergies. I don’t want you to miss out too. In fact the cookies pictured were made with gluten free flour mix. 3/4 cup brown sugar (can substitute coconut sugar). In a small bowl, beat together the egg and vanilla. Set aside. In a larger mixing bowl, stir together the flour, graham cracker or gingersnap crumbs, salt, cinnamon, and nutmeg. Set aside. In the bowl of a mixer, stir together the butter and sugar on medium speed until light and fluffy. (Approximately 2-3 minutes). Reduce speed, scrape the bowl if necessary and add in the egg and vanilla, stirring just until smooth. Slowly add in the flour mixtures, continuing to stir until well mixed. Fold in the apples and toffee bits. Drop the dough by rounded tablespoons onto a baking sheet. Bake at 350 degrees for 9-12 minutes (if using coconut sugar cookie baking time will decrease to the 9-10 minute mark). Remove from oven, allow cookies to cool for several minutes before moving to a wire cooling rack to finish cooling completely. 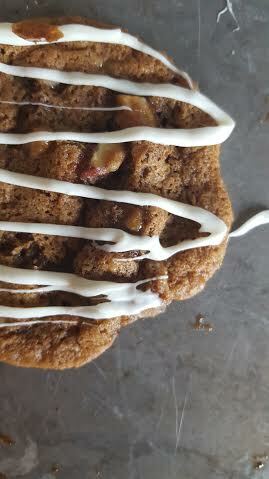 Drizzle melted white chocolate over the cookies once cool if desired. How lucky you are to have your very own apple tree! Found you on Merry Monday blog hop! This recipe sounds delicious, and I still have a bushel of apples left to use 🙂 Thanks for sharing! These sound heavenly! Thanks for linking up to Merry Monday! Sharing on Twitter! Have a great week!